Buy Live Comfrey: Root Cuttings. True/Common Comfrey Seeds. Organic. 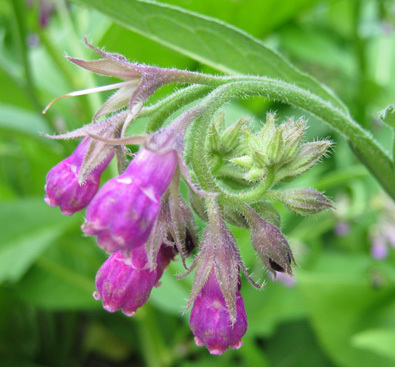 "Your site is very educational and helped me gain an appreciation for comfrey." -Tony, ToDoListHome.com. 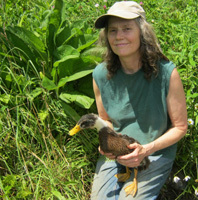 YouTube video showing Nantahala Farm Comfrey Roots. 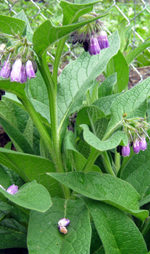 Comfrey is high in protein: 22-33%. High in vitamin A, C and B-12. Rich in silicon, calcium, potassium, phosphorus, iron, iodine and more. Very high food value for animals such as goats, cattle, sheep, horses, pigs, chickens, and ducks. Used as a folk remedy for thousands of years. Known as boneset and knitbone. Comfrey is superb for improving your soil. It can be used as compost material for organic gardens. It is very deep rooted so it mines many nutrients from the soil. The fast growing leaves contain these nutrients. When you cut the leaves, they quickly break down to a thick, black, fertile liquid great for your garden. 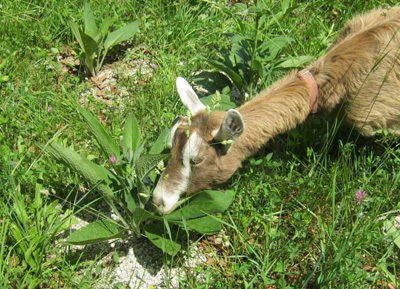 Since Comfrey is a valuable perennial, it is popular in Permaculture for ecological farming systems that benefit both land and people. 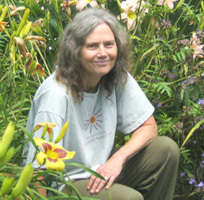 Permaculture is defined as "the development of agricultural ecosystems intended to be sustainable and self-sufficient." Dr. Rudolf Steiner, father of Biodynamic Agriculture, lists these 7 plants as being very important on a farm: comfrey, Stinging Nettle, Yarrow, chamomile, horsetail, dandelion and valerian. Others have added burdock to the list. Comfrey (Boraginaceae family; Symphytum genus) has large, hairy leaves up to 10 inches long. Russian comfrey grows 4 feet tall. True/Common grows 3 feet tall. 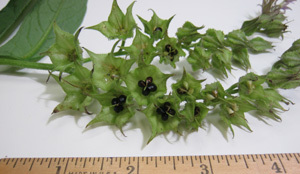 The flowers are small, bell-shaped either white, blue, purple, yellow, magenta, or pink. They start blooming in April or early May and continue to bloom for most of the summer. 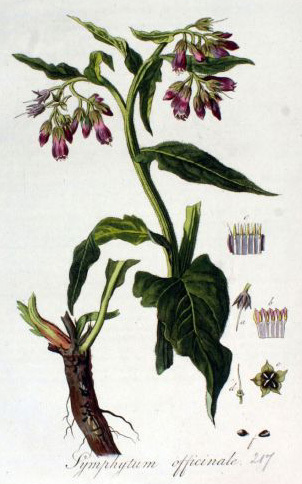 Russian comfrey (Symphytum x uplandicum) is sterile so it will not reproduce through seeds. True/Common Comfrey (Symphytum officinale) does reproduce by seeds. Comfrey is a perennial that is very prolific in all climates. It does well in clay, light sands, and loams. It can be planted at any time of the year that the ground is not frozen. Comfrey's fountain of large dark green leaves make a wonderful addition to your landscape. The flowers are showy and beautiful. Comfrey grows well in USDA Hardiness Zones 3-9. Comfrey does well in full sun or partial shade. In very hot climates partial shade can be better. 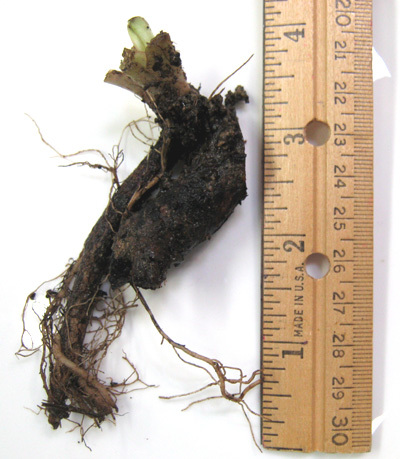 Plant root cuttings several inches deep with the root sitting horizontally. It likes fast draining soil. Do not overwater. You can kill plants if the soil is always wet. Let soil dry out between watering. Comfrey roots rot if there is too much water. Plant Russian Comfrey (Symphytum x uplandicum) about 3 feet apart in each direction. Plant True Comfrey (Symphytum officinale) about 2 feet apart. It is best to dig in manure between the rows in the fall or spring. Raw manure will not burn it. Comfrey loves nitrogen. You will get a lot more yield. You can remove flower buds when they appear since they take a lot of the plant's energy to produce. However, bees and other beneficial insects love the flowers so I like to leave some flowers for them. If you receive comfrey roots and your ground is frozen, fill some gallon or larger pots with potting soil. Plant 1 or several in the pot. Keep in window inside, or put in greenhouse/coldframe outside. Keep well watered. If you can't plant right away, you can keep them in the refrigerator (not freezer) for a few days. Comfrey is easy to grow and has few diseases or pests. Harvest leaves from the plant throughout spring, summer and fall. Do not harvest late fall so the plants can store up energy for the winter. You should get at least 3 cuttings a year, sometimes even 6. 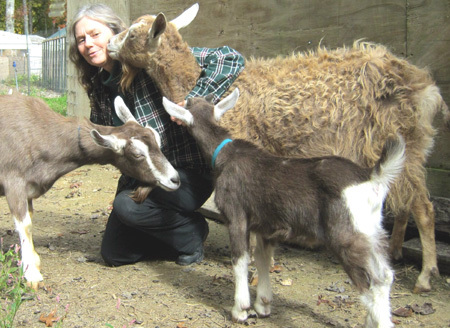 This photo with the goat shows how it was planted in a pasture. These are young plants. A small area was cleared of weeds and one comfrey root was buried. While it was developing, the area was kept weeded. Once the plant is established, you don't have to weed around it any more. 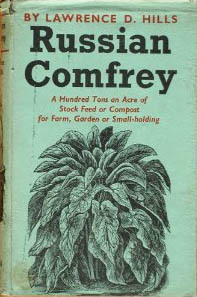 Lawrence Hills wrote 3 important books on comfrey (see below) as well as books on organic gardening and natural fertilization. 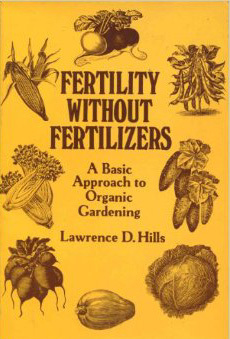 The gardening books include "Fertility Without Fertilizers", "Organic Gardening", "Grow Your Own Fruit & Vegetables", and "Fighting Like Flowers". Unfortunately, none of the below comfrey books are still in print. 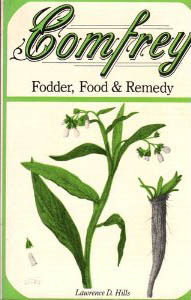 The book "Comfrey: Fodder, Food and Remedy" by Lawrence D. Hills is highly recommended. It was published 1976. Mr. Hills is the world's leading expert on comfrey. 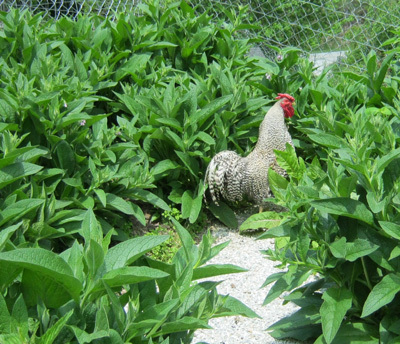 He discusses how to properly cultivate comfrey so you enjoy its benefits. 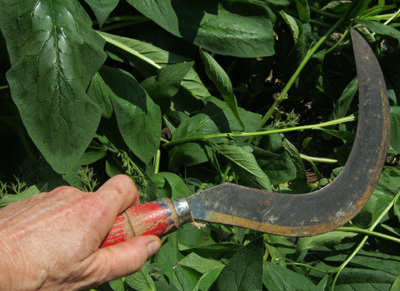 The protein yield per acre from comfrey is almost 20 times that of soybeans. Dairy animals produce high quality milk. It is high in potassium, Vitamin A and Vitamin B-12. The book "Comfrey: Past, Present and Future" by Lawrence D. Hills is the exact same book as the above book. The only difference is that the second book is a poor reproduction (photocopy) of the first book. The photos are not as good quality. It was published 2009. The black and white photo is Lawrence Hills working in a field of comfrey. 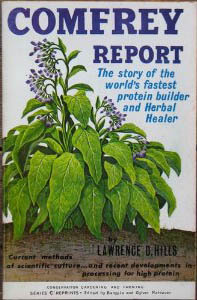 Another book by Lawrence Hills is the "Comfrey Report: The Story of the World's Fastest Protein Builder and Herbal Healer" (Conservation gardening and farming series: Series C, Reprints). It was printed in 1975. It contains "current methods of scientific culture and recent developments in processing for high protein". "Russian Comfrey: A Hundred Tons an Acre of Stock or Compost for Farm, Garden or Smallholding" by Lawrence Hills is an excellent book. It was printed in London in 1953. 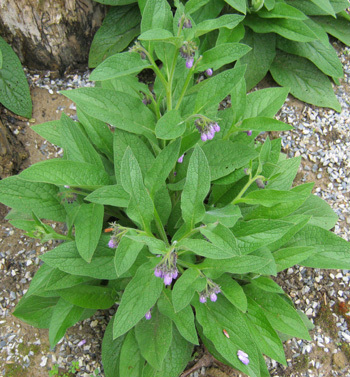 It covers the history and use of comfrey in Great Britain. 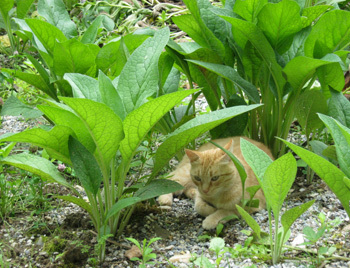 It is full of information about how to grow and harvest comfrey. And then feeding it to livestock or making compost. One farmer planted 1/4 acre of Russian Comfrey that provided enough food for 3 cows and 2 horses. 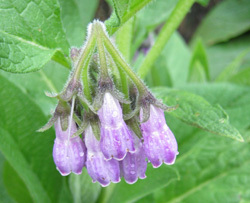 This photo taken by Ray is comfrey at 3,000 feet elevation in Greenwood, British Columbia, Canada. This photo is from Richard in Voorheesville, New York (grow zone 5B). He is 6 feet tall.